This seller is currently away until Apr 29, 2019. If you make a purchase, there may be a delay in processing your order. dish39 has no other items for sale. 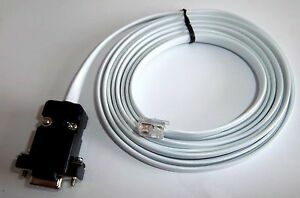 Dsub 9pin female to RJ11 (4 pin) cable. Cable can be used on variety of different models; Model LXD 55, 505, ETX80, LX90 495/497 & many more other models. This cable is used on variety of different models; Model LXD 55, 505, ETX80, LX90 495/497 & many more other models.